Blink-182 guitarist Tom DeLonge talks about deep space, telescopes, NASA and science. Yes, and poop. Tom DeLonge is big into space. For half our interview, the guitarist and vocalist for snotty punk band Blink-182 geeks out on astronomy. It’s not terribly surprising. His side project, Angels & Airwaves, recently released a full-blown film about an astronaut, Love, shot in a space station built by hand. 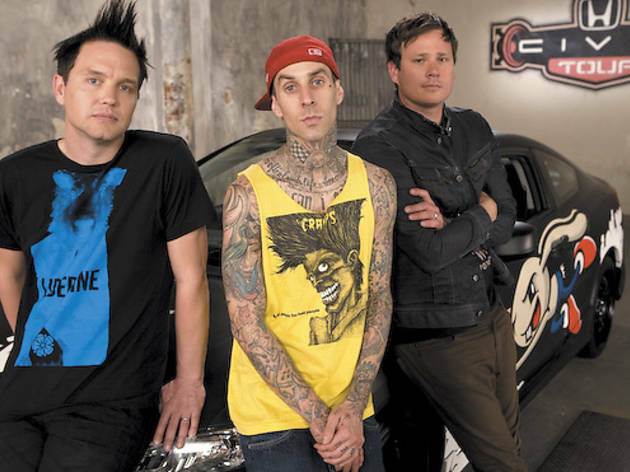 Now DeLonge, pictured far right, puts his attention back on Earth with Neighborhoods, Blink-182’s first album in eight years. What were you feeling during the last shuttle launch? I have mixed feelings about the shuttle missions. It’s widely known in the science community that the science coming off the shuttle missions was not that much better than science projects going on with some of our more advanced high schools. Having it land and be finished is important because there’s a tiny handful of things that they did that were absolutely revolutionary, but for the most part it was sucking up a budget that could have been utilized for something different. Perhaps. But I think kids need to look up to astronauts. But the most amazing things have happened in the past four years. Just the Kepler Mission itself. By 2012, we will know if life is absolutely everywhere in the universe. That’s what’s supposed to happen with that satellite. On iTunes I saw this review of Blink’s new single: “Sing about poop more!” How do you please that fan base when you’re obviously into headier things? That’s so funny. By no means have I abandoned that side of myself. If I was to ask you to explain yourself in ten songs, you wouldn’t be able to. You’ve had a lot more life experience than that. Before I play, I might have a lot of alcohol and blast Van Halen and want to break something. Or I might be up all night looking at results of the Hubble deep-space project. Two thousand and eight was a hard year for Blink. Was that the year we broke up? Or was that 2006? I was talking about Travis [Barker’s] plane crash. The death of your producer. 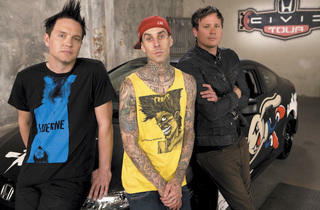 Blink-182 plays First Midwest Bank Amphitheatre Saturday 20.